So we chilled out a little last week after finishing a major update to Signature which hopefully will be available in about a week awaiting Apple approval. We're always promoting the little guys, like at TheGoodBlogs showing the lesser known bloggers. 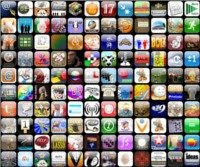 At the Apple appstore, there are over 75,000 applications clamouring for your attention. Unfortunately like Google search pages, people rarely go beyond the first 2 or 3 pages which means if your app is not in the Top 100 of either recently posted or most popular list, you're on a downward spiral to nowhere fast. We decided to create a wall of app icons (similar to the physical wall they did at MacWorld. This time it's virtual. Here's a small screenshot of a typical wall. Check out full size image at The Great Wall of Apple. Each category has several walls each holding 120 icons. There are 21 categories so you could spend quite a bit of time, browsing the walls. Don't forget to click on the top right hand corner of the wall to see the next part of the wall.